The Expanse - Syfy's "most ambitious TV series to date"
If you can believe it, Syfy may be getting back to its pre-name change roots. A notable addition to its plans for the next year is a new TV series based on a popular series of sci-fi books known as The Expanse. 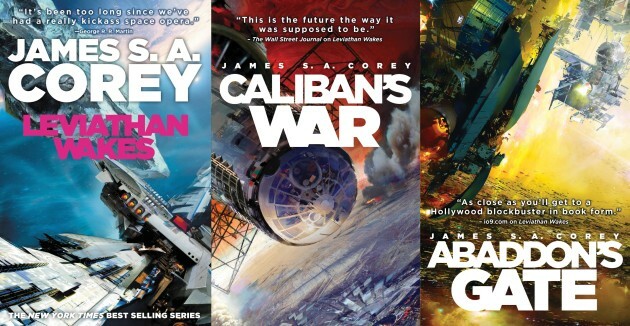 The first book Leviathan Wakes snagged nominations in 2012 for the Hugo Award for Best Novel and Locus Award for Best Science Fiction Novel. Set 200 years in the future, it focuses on a ship captain and detective searching for a missing young woman, with a sprawling story and scope that have netted comparisons to both Star Wars and Game of Thrones. We'd be more than pleasantly surprised if it reached anywhere near those heights, but Syfy president Dave Howe is claiming this is the network's "most ambitious series to date." The books are written under the pseudonym James S.A. Corey by Daniel Abraham and Ty Franck, who will be among the show's producers. Whatever happens with the show, we'll get the full 10-episode season Syfy ordered based on a script by Mark Fergus and Hawk Ostby (Children of Men -- sort of, Iron Man) who are the show's writers and executive producers. Whether it is anything like Game of Thrones it's at least a return to Battlestar Galactica-style scifi for the network instead of a new series of Celebrity Ghost Stalker Makeup Artists. Syfy alone is also working on new series 12 Monkeys, Dominion, Ascension and the second season of Helix, which combined with Netflix's Sense8 from the Wachowskis, Amazon's The After from X-Files creator Chris Carter and the return of Heroes on NBC next year make this an interesting time to be a sci-fi fan. Looks pretty interesting and promising. Let's hope Syfy gets back to the greatness of Stargate and Battlestar Galactica! Has anybody read the books yet? It's been AGES since I read good sci-fi/space opera. Holy [expletive] this is going to be a tv show? The books are [expletive]ing awesome by the way. Remind me so much of mass effect. ^ Mass Effect? That's one of my favorite videogames of all time! I actually started to play the saga for the 3rd time a few weeks ago. I guess I'll have to read those books. As soon as I finish these calibrations, of course.